The match-three puzzle battle game challenges players to complete two campaigns based on Star Trek: The Original Series and Star Trek: The Next Generation. Kingcraft developer Genera Games has partnered with CBS Interactive for the release of Star Trek: Wrath of Gems on mobile devices. The match-three puzzle battle game sees players interacting with characters from the Star Trek universe, with two campaigns based on Star Trek: The Original Series and Star Trek: The Next Generation. In each turn-based ship battle, players work to make matches with green and red symbols to damage the enemy’s ship. Each ship is protected by a shield, which can be recharged by making matches with shield symbols. The rest of the board is filled with colored symbols relating to special abilities. Players must collect these symbols in bulk to charge their abilities for use. During turn-based close combat battles, players can make matches with any color of symbols to damage the enemy, with specific colors charging their team’s abilities. The enemy may have more than one team member, so players can tap to target a stronger or weaker enemy first. Finally, diplomatic combat encounters challenge gamers to ‘persuade’ another character by making matches with specific colors of symbols, while avoiding others. As players complete battles, they may need to heal their crew or ship before taking them into the next encounter (if not, they begin the next battle at a disadvantage). Gamers can heal their units instantly with healing items, or can wait for the healing to take place automatically over time. These healing items are sometimes received as rewards for completing missions. Other rewards include ship or crew cards, which can be used to upgrade an existing ship or crew member. These may allow players to unlock new skills for their units, which give them more options during battle. The game’s free currency can also be used to instantly level-up characters, increasing their health and other stats. Gamers can replay missions to earn additional rewards, including premium currency, which is used to purchase new card packs in the game’s store. Outside of the game’s single-player campaigns, players can compete against others in limited time events for a chance to win extra rewards. It has been an exciting challenge which has garnered a tremendous reward. We’ve been able to develop an exceptional game for an iconic brand, and we’ve enjoyed every minute of the process working with the team at CBS. This game has been polished for over six months, and we’ll continue releasing new content after launch. We feel immensely proud of this game and our partnership with CBS Interactive. 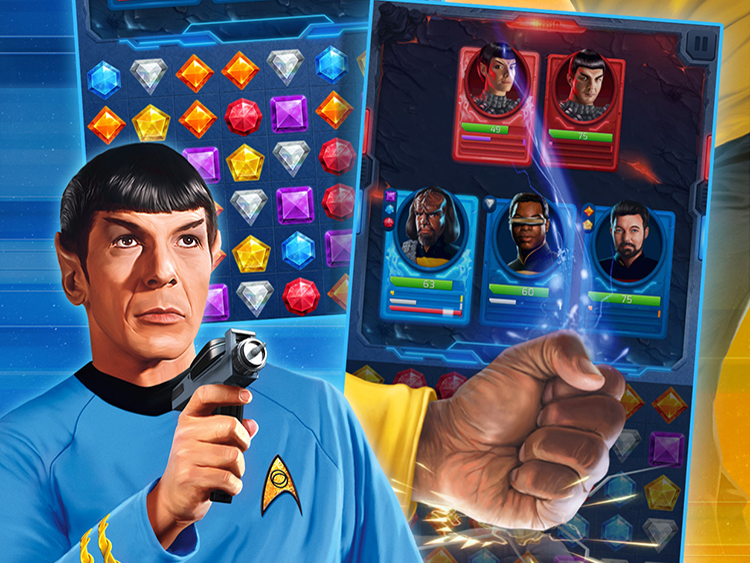 Star Trek: Wrath of Gems is available to download for free on the iTunes App Store and Google Play.